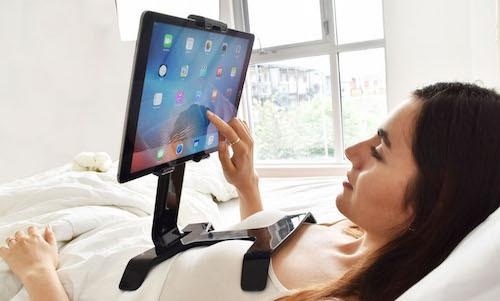 What makes Tstand a great iPad holder for bed? Using an iPad in bed can be tricky. We often find ourselves twisting, turning and adjusting our position – adapting our bodies to work with the tablet’s small size. Hunching over our device like this can create a forward head posture which will lead to chronic pain down the road. Holding an iPad frequently and for long periods of time can also trigger more serious health conditions like Carpel Tunnel Syndrome. At SurfaceID, a Montreal-based industrial design firm, we developed Tstand in order to help solve this problem once and for all. 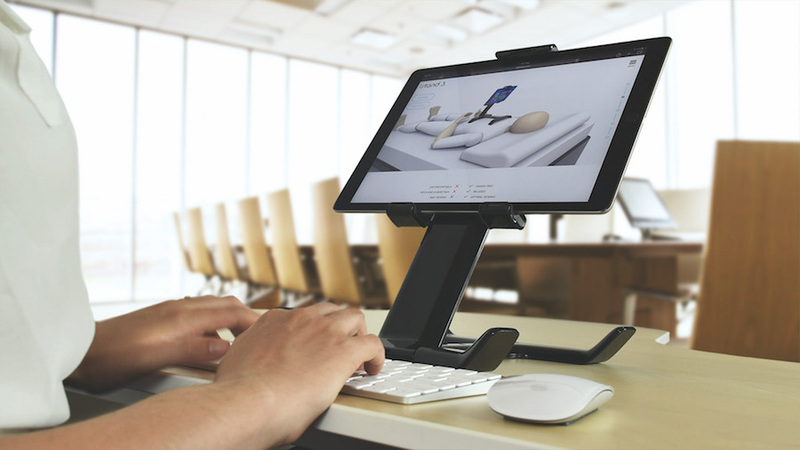 Tstand is a versatile, multi-use tablet stand. 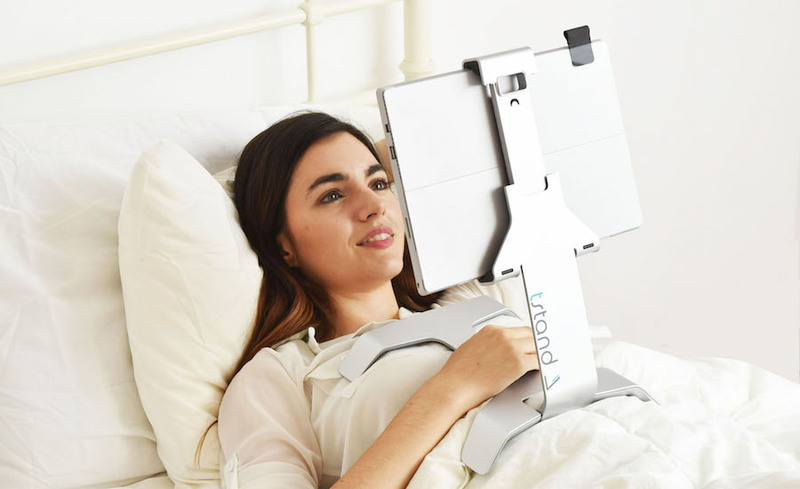 But more than anything, since the launch of our Kickstarter campaign, we’ve heard again and again that Tstand is a great iPad holder for bed. 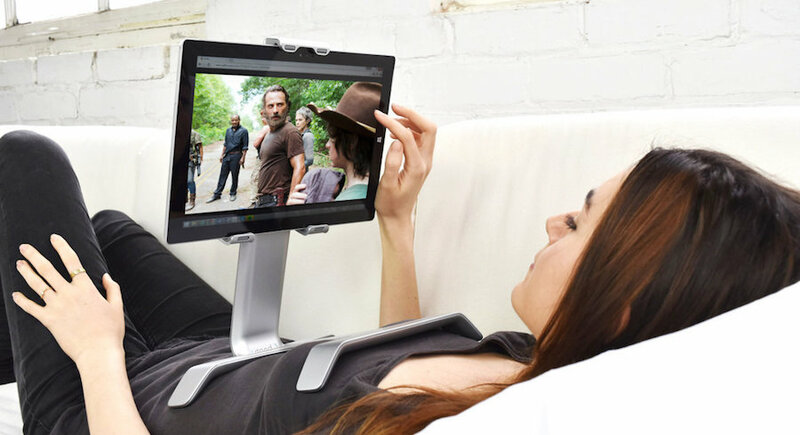 Whether you are lying in bed, reading an eBook on the couch, or lounging in a recliner chair, Tstand will elevate your tablet to a comfortable, ergonomic position. This means less time spent adjusting your body and more time enjoying the contents of your iPad’s display. Tstand holds your tablet for you. This allows you to enjoy your tablet’s maximum functionality while using your hands for more important things (like eating candy). Our unique design lets you position your tablet at the perfect height, eliminating all sources of potential neck and back strain. Now you can watch an entire movie comfortably, and hands-free. You can rest easy knowing you will no longer have to contort your spine into an awkward position to enjoy your tablet. Your technology, after all, should work for you rather than against you. Tstand instead makes using an iPad an effortless and ergonomic experience for users of all ages. For a small child, turn your iPad into a perfect miniature TV monitor with Tstand’s help. 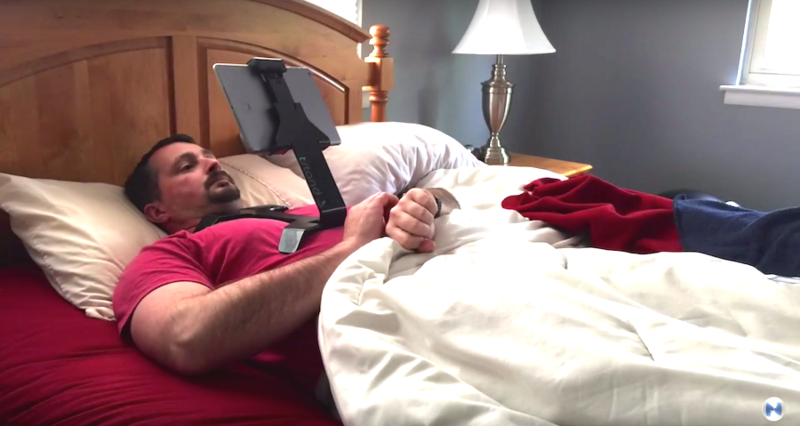 There are several iPad bed stands on the market, and so far none have proven to be as effective and multi-functional as the Tstand. Insert any tablet 7” to 13” into the Tstand and use its sturdy H-shaped base to comfortably balance your device on your chest or lap. Tstand’s base rotates almost 360 degrees. The base can either hug your body or stand firmly on any solid surface. When positioned on your chest, its legs curve inwards at the optimal angle for perfect balance and stability. Your iPad will remain easily viewable at eye-level. Best of all? No more aches and pains after a long tablet session! What are experts saying about the Tstand? At first, our design might look a bit silly. You might even think that the ergonomic challenges of a tablet are, how you say, “first world problems,” like this Redditor. But if you give us a chance, we promise you will never go back to your old way of using a tablet ever again! If you are a self-proclaimed iPad addict, you need to get your hands on this stand. Holding your iPad while playing a game on your tablet can’t be comfortable for long! We have also gotten tons of positive feedback from our customers about how the Tstand will benefit them beyond being an awesome cinematic experience. A few of you have reached out personally to let us know that Tstand is going to be a real lifesaver for those who are either confined to bed due to injury or illness or suffer from joint disorders, such as arthritis. Okay, you get it. Tstand is a great iPad bed stand. But what else can you use it for? Tstand offers a convenient, easy and ergonomic solution for tablet usage, no matter how you use your iPad. Be it sitting down, following a recipe in the kitchen, setting up for a meeting at work, Tstand has your back. We believe in a healthy, adventurous lifestyle full of travel and the great outdoors as well as some occasional guilt-free Netflix indulgence. But your technology should always work with your body rather than against it. Enter: Tstand. Let us help you enjoy a healthier relationship with your iPad or tablet, no matter how – or where – you are using it.